Known as the Piazza del Sol now, it was the Hacienda Park Apartments when Paul Wharton was murdered there in 1935. Arrow points to a kitchen window from which a young man jumped minutes after Wharton was killed. The evening of Thursday, April 25, 1935, began quietly for Ada Wharton, a wealthy widow in her mid-fifties, who lived as an invalid in her elegant flat at the Hacienda Park Apartments – a building on the Sunset Strip known today as the Piazza del Sol. Around eight o’clock her son, Paul, brought in her dinner tray. After getting her settled, he returned to his guests in the dining room. As she dined alone, Ada could hear Paul and his friends – his secretary-chauffeur Billy Howard and one, maybe two other men – chatting over their meal. From the sound of it, it was an uneventful, even pleasant dinner. By 10 p.m., Ada had finished dinner and returned to her reading. The dinner party had ended and the guests had left, or so she thought. Suddenly, she was jolted by the sound of gunfire in the front room, three shots: POP-POP-POP! Afterwards someone fled the apartment, slamming the door on the way out. Terrified, her heart racing, Ada made her way to the living room. There she found Paul on the floor, bleeding and fighting for his life. She was by his side when he took his last breath. The silence was broken by a soft knock at the front door. Fearing the killer had returned, Ada said nothing. The door opened revealing a young man, a stranger – tall and thin with blond hair. Ada stared at him as realization dawned and he comprehended what he was seeing: Ada was crouched beside Paul’s body, which was covered in blood. He panicked, lurched past them, ran into the kitchen, opened the window and jumped. The 18-foot drop was broken by a small tree in the alley. He scrambled to his feet and stumbled out to Sunset. He took a left and hurried away. Within the hour the Whartons’ apartment was swarming with police and reporters. From Ada Wharton, detectives learned that her son, Paul Ivar Wharton, was 25 years old. He was a dress designer with a small but exclusive clientele of Hollywood stars and socialites. He employed two seamstresses and ran his business out of their flat at the Hacienda Park. He was born in Billings, Mont., she said, and had been adopted by a doctor and his wife who later moved to Los Angeles. After his parents died in 1927, Ada met him through her church and eventually became his foster mother. 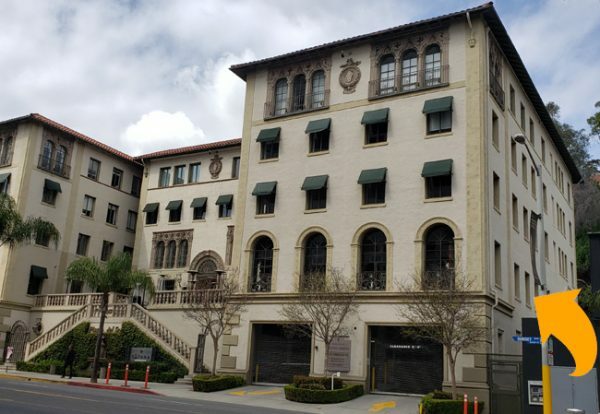 Ada had once been active in the Angelus Temple in Echo Park, the home church of Sister Aimee Semple McPherson, the internationally famous radio evangelist. But she’d had falling out with Sister Aimee in 1928 and left the church. In fact, Ada and others had sued the evangelist over what appeared to be a shady real-estate deal. “Several members of Angelus Temple told me about Paul,” Ada later told a reporter, “and said they wanted to find him a good home. He came to me and told me he was anxious to follow his designing work and already had managed to obtain a fashionable clientele.” He was 16 years old when she legally adopted him in 1927. How it happened that Paul was shot dead in his living room and by whom, Ada could only guess. Perhaps he’d had an altercation with someone at his dinner party. She knew next to nothing about Paul’s chauffeur-secretary, except that his name was Billy Howard and that he was in his mid-thirties. She was unsure whether there was just one other dinner guest or two. And she did not know the tall, blond stranger who jumped out the window. When detectives checked the alley, they found a man’s brown hat and a ripped fragment of a shirt the bushes. Why Did Howard Want to Shoot Me? Meanwhile, three miles east of the murder scene, in an apartment on Gordon Avenue just off Sunset, Virginia Bolte had put her children to bed and was sitting up waiting for her husband. Dark-haired, mid-thirties with hair parted in the middle and a face like a porcelain doll, Virginia was not worried about her husband’s whereabouts. 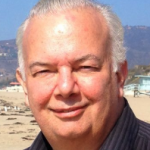 Henry Bolte was a UCLA law instructor, a recent candidate for the U.S. Congress and chairman of a civic group called the Voters’ Forum. It was not unusual for him to come home late. At about 1 a.m., Virginia heard Henry in the hallway fumbling with his keys. She unlocked the door and swung it open. There was Henry in the pitch dark corridor, house key in hand. But before either of them could speak a gun fired at close range – POP-POP! Henry was hit in the back. He dropped to the floor at her feet. Now she saw another man in the shadows – someone she recognized. Billy Howard. The surreal moment turned hallucinatory. To Virginia’s horror, Billy raised the pistol to his head, placed the barrel against his temple and fired. POP! Billy died instantly, collapsing onto the floor. Virginia sank to her knees beside her husband. Despite his wounds, Henry was conscious. “Who shot me?” he asked her. Henry was dumfounded. “Why did Howard want to shoot me?” he asked. That question would propel the investigation for the next several days. Detectives quickly connected the two crime scenes. They found a photograph of Billy Howard in Paul Wharton’s room. Paul’s expensive car was parked where Billy had left it, at the curb outside the Boltes’ apartment building. And forensics analysis showed that the bullets recovered from both crimes scenes had been fired from Billy’s .32 caliber revolver. It was obvious. Billy Howard killed Paul then drove to the Boltes’ apartment building where he’d laid in wait for Henry Bolte, shot him twice and then turned the gun on himself. The mystery then was why – what had driven Billy Howard to kill the two men? What was his connection to his victims? And what role, if any, did the tall, blond man play in the attacks? Detectives rushed to the hospital to question Henry Bolte. But he gave them nothing. In fact, he flatly denied knowing either Billy Howard or Paul Wharton. Questioned a short time later, however, Virginia Bolte told a different story. She didn’t know Paul Wharton but Billy Howard was a former family friend and frequent visitor at their home. He’d also served as secretary for Bolte’s Voters’ Forum organization, and had worked as a driver for his congressional campaign. He died before the day was over. 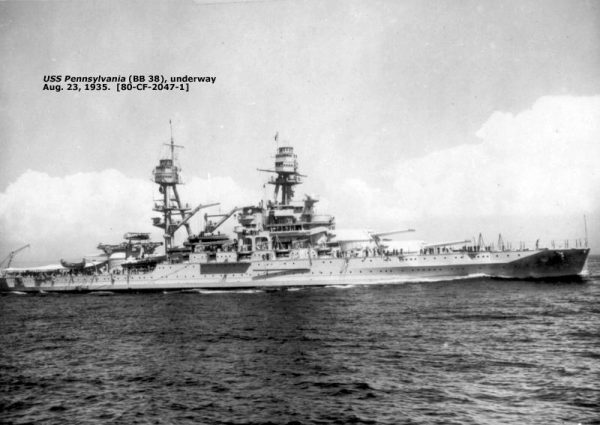 Later that day detectives drove to port at San Pedro where the USS Pennsylvania was docked. The mysterious tall, blond man who’d jumped from the Wharton’s kitchen window had been identified as an AWOL sailor, N.C. McDermitt, 21, seaman second class, serving on the USS Pennsylvania. He had gone on shore leave on Friday, April 19, but had failed to report back. Shore police located McDermitt and returned him to his ship. Detectives took his statement there that afternoon. McDermitt said Paul and Billy approached him soon after he’d gone ashore in San Pedro on Friday and offered him a ride to Hollywood. Being at loose ends with nowhere in particular to go, he accepted. McDermitt spent the next six days with the two men. He rode along as Billy Howard drove Paul to meetings and on shopping excursions. In the evenings they had dinner at Paul’s. McDermitt spent the nights with Billy at his apartment downtown. But before McDermitt even made it downstairs to the garage, Billy rushed passed him and got into his car. Shouting something about meeting up later, Billy drove off, taking a left onto Sunset Boulevard, leaving the hapless sailor bewildered – and stranded. McDermitt was also broke. He decided to go back upstairs and ask Paul for streetcar fare to San Pedro. When he returned to the apartment, the shock of seeing Paul’s lifeless, bloody body drove him to jump out of the window. As the investigation unfolded, background information on Billy Howard proved harder to come by. Detectives learned he was William McCauley Howard, 35, son of Mr. and Mrs. Edgar Howard of Washington, D.C. He apparently served in the military at one time. In photos he appeared to be a handsome, clean-cut fellow, if somewhat sallow, with dark hair. At the time of his death was renting a room at the Norfolk Apartments at 820 1st Street on Bunker Hill. He had relatives in Los Angeles, but neither they nor his parents made public statements in the wake of the tragedy. Interviews with the two seamstresses who worked for Paul Wharton revealed that, contrary to what Henry Bolte told detectives on his deathbed, he did know Paul Wharton. “I don’t know exactly what Mr. [Wharton’s] connection with him was,” one of the women told a reporter, “but they frequently talked on the telephone.” She said Henry Bolte had visited the studio a few times during working hours and described Paul and Henry as close friends. Talking with Paul Wharton’s friends, investigators learned that he’d told them he’d once hosted a radio show on fashion in New York and that he had edited the fashion pages of a Hollywood magazine. He also claimed that New York crime boss Arnold Rothstein had entrusted him with a million dollars and that he’d stolen some of the money. Fortunately for him, he said, Rothstein was murdered and never found out he’d pilfered the loot. Current day research uncovered genealogical information about Paul that doesn’t quite square up with what Ada Wharton told police. According to these sources, he was born, not in Billings, but near Missoula, Mont., in 1909. He was placed in an orphanage as an infant and adopted right away by Mr. and Mrs. Charles Dorsett of Billings, who named him Charles Orin Dorsett. The family relocated to Spokane, Wash., when the boy was ten years old. He left home at age 17, apparently because his adoptive father disliked his artistic temperament and flair for fashion. According to these accounts, he made his way to Los Angeles where he fell in with the wrong crowd, dabbling in drugs and petty thievery. He might have succumbed to a life of crime had he not been taken in by the Angelus Temple where Sister Aimee “cured” the young runaway of his drug addiction – and it was through the temple that his adoption by Ada Wharton was arranged. Ada Wharton told police that the breakthrough in Paul’s career came when he designed robes for the Angelus Temple choir as well as a few of Sister Aimee’s trademark priestly garments. This was confirmed by Sister Aimee’s secretary, May Waldron, who told a reporter that the evangelist had particularly liked a white cape with a reversible red underside Paul had created. 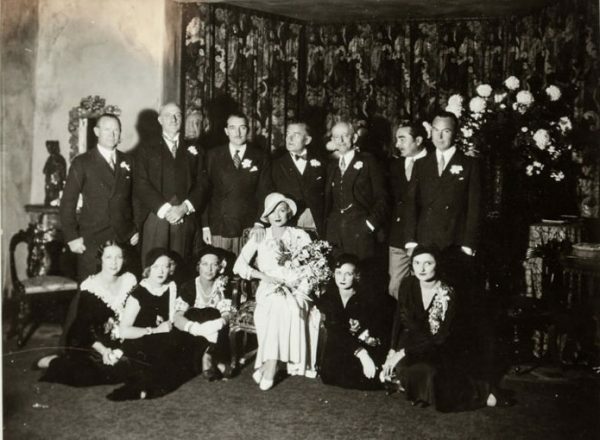 Wedding party: Portrait of Constance Bennett and Henry James La Bailly, Marquis de la Falaise de la Coudraye and attendants at their wedding in 1931. Paul Wharton designed the bridesmaids’ gowns. Police also learned that Paul was on probation related to the theft of a diamond ring. According to one source, he’d “borrowed” the ring from a client, Mrs. Ray Wolfe of Beverly Hills, while they were having tea one afternoon. He later claimed he’d lost the ring, which was valued at $1,100 (about $20,000 today). Earl admitted he had supported Bolte’s campaign and had even helped him financially because “he felt sorry for his kids.” Detectives were otherwise unable to connect Bolte to the counterfeiting scheme, but they did learn that he’d recently been convicted on three counts of petty theft related to unpaid campaign loans, totaling $450. His sentence of 180 days in jail was under appeal when he died. At the coroner’s inquest on May 1, Capt. Norris Stensland of the Sheriff’s homicide squad testified that letters discovered in the Billy Howard’s room had revealed the motive for the murders. And that became the official story. Billy Howard was driven to murder because he was broke, and Paul Wharton and Henry Bolte had to die because they owed him money. But is that the real story? There are questions about the case that resonate today in ways they likely did not 80 years ago. For example, what were Paul and Billy doing down at San Pedro picking up sailors? Trolling the docks was a cliché gay pursuit back then not unlike hooking up on Grindr is today. And why did Henry Bolte deny knowing Paul and Billy? What was he so desperate to hide that he lied about it on his deathbed? While the American press danced around it, the gay angle was the central theory of the case as presented in an August 1935 article in the French detective tabloid, “Police Magazine.” Titled “Hollywood-La Mystèrieuse,” the article asserted, without evidence, that Paul and Billy were gay – men who indulged in “l’amour qui n’ose pas pas dire son nom” – “the love that dare not speak its name” – and that they’d met in jail. To 21st century eyes it certainly appears there was some sort of relationship tangle among Billy Howard, Paul Wharton and Henry Bolte, with a sailor thrown in for good measure. Perhaps it was jealousy that drove Billy insane. He killed Paul and Henry and then killed himself. A crime of passion – a tragic story as old as the Greeks. What a interesting look into the Sunset Strip’s past. Was it called the Sunset Strip in the 1930s? Apparently, the area was a “dandy” hotspot before it became the city we all know.